← MSNBC: The Russians are coming! 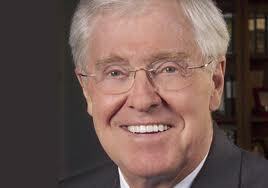 No, Charles Koch is not some harmless old dude posing for a dentures ad. Democrats say the strategy of spotlighting the Koch brothers’ activities is politically shrewd. The majority leader was particularly struck by a presentation during a recent Senate Democratic retreat, which emphasized that one of the best ways to draw an effective contrast is to pick a villain, one of his aides said. And by scolding the Koch brothers, Mr. Reid is trying to draw them out, both to raise their public profile, and also to help rally the Democratic base. It’s true. The billionaire Koch brothers, David and Charles, have been demonstrating for years that they are serious about destroying labor unions, minimum-wage laws, environmental regulations, government-sponsored health care and everything else that might interfere with their money lust and benefit average citizens. There is no right-wing yahoo candidate they wouldn’t spend a fortune to elect. They are impossible to caricature. The great film director Frank Capra couldn’t have invented plutocrats as vile and greedy as the Kochs. And yet the Dems in Washington are only now getting around to fighting back, even though midterm elections are less than a year away and the Kochs, for months, have been cranking out expensive propaganda on behalf of Republican candidates. But that’s a dead end, too. The closest thing Dems have to the Great Oz is Barack Obama, and he turned out to be an even bigger fraud than the Wiz in the old movie. This entry was posted in campaign finance reform, climate change, Congress, dirty rotten scoundrels, environmentalism, health care, humor, mainstream media, Obama, plutocracy and tagged "pick a villain", Harry Reid, Koch Brothers, midterm elections, swamp rabbit, Tinicum. Bookmark the permalink.